‘The Simple Things’ was to be Mickey’s and Pluto’s last theatrical cartoon (Pluto’s own series had stopped two years earlier). Unfortunately it is a rather uninspired goodbye. The cartoon returns to the elongated situation comedy of the thirties. There are only two plots here, which hardly build up to a finale. 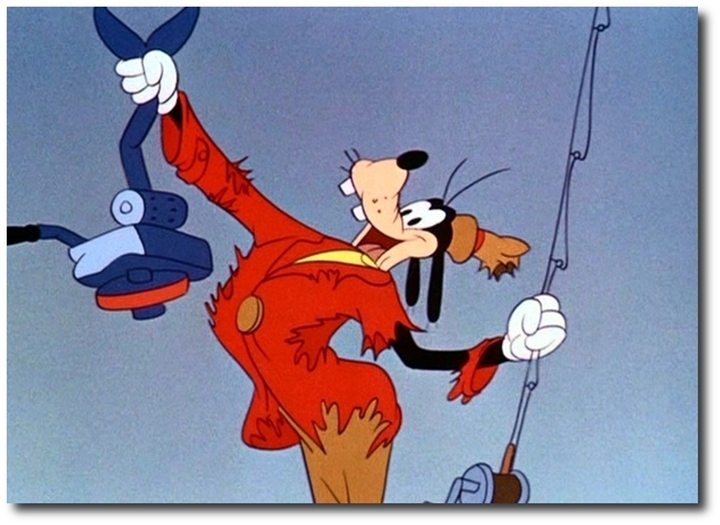 First: Pluto’s encounters with a humanized clam and second, Mickey and Pluto’s fight with a hungry seagull. Both parts are executed routinely, without inspiration. This makes ‘The Simple Things’ a sad ending to a career that started so phenomenally well, changing the course of animation, 25 years earlier. It would take Mickey another thirty years to return to the movie screen in ‘Mickey’s Christmas Carol‘ from 1983. Meanwhile, Mickey & Pluto director Charles Nichols would direct three Donald Duck cartoons, and one special, ‘The Saga of Windwagon Smith‘, before leaving Disney for Hanna-Barbera in 1962. 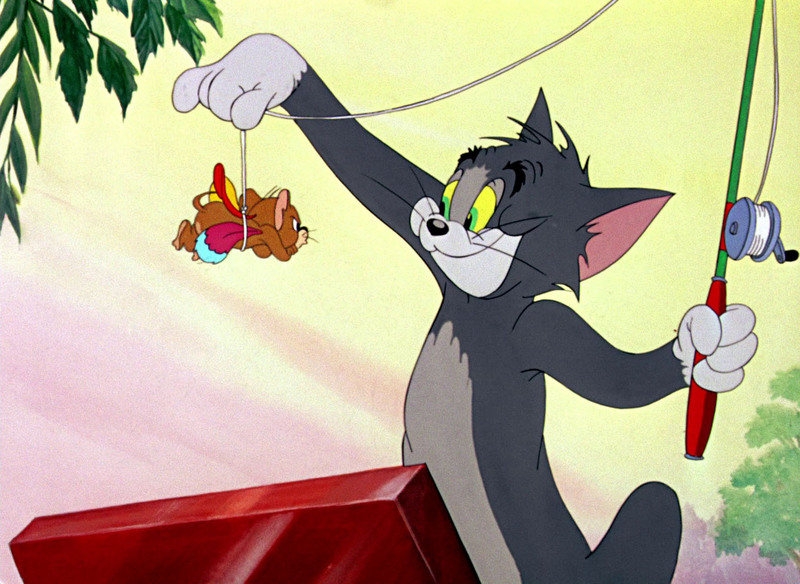 In ‘Down and Outing’ Tom and Jerry join a fat man who goes fishing. 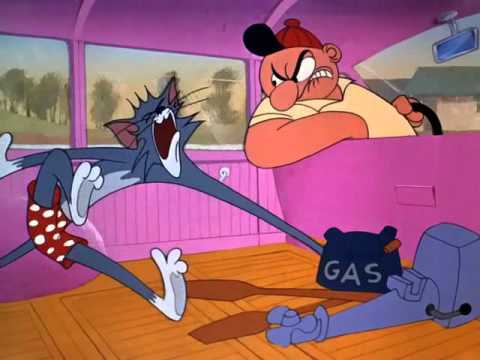 During the cartoon Tom tries to get rid of Jerry, mostly on expense of the man. ‘Down And Outing’ is the second of thirteen Tom & Jerry films by Gene Deitch, and like in the first, ‘Switchin’ Kitten‘, a rather inspired story (by Larz Bourne) is ruined by bad design, bad timing, bad animation and bad sounds. The fat man would become Gene Deitch’s best attempt on a recurring character, returning in ‘High Steaks‘ and ‘Sorry Safari‘ (both from 1962). To the next Tom & Jerry cartoon: It’s Greek to Me-Ow! 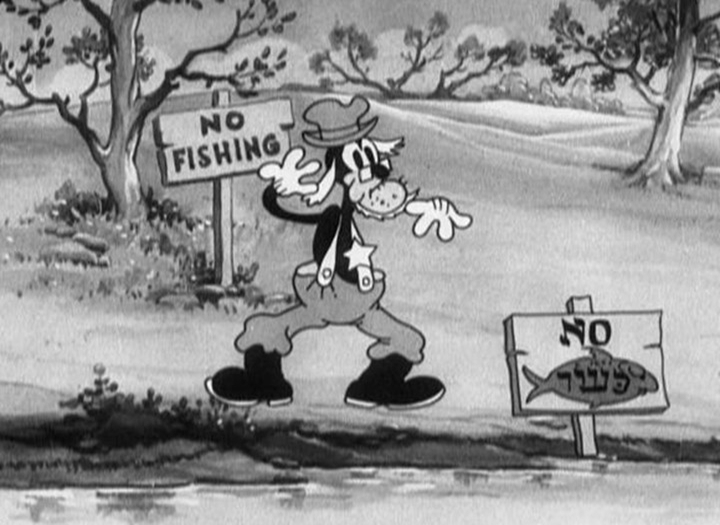 Mickey and Pluto go fishing in a no fishing area, but the fish are making fun of them. Pluto even gets under water, sniffing the bottom of the lake and meeting an enormous fish. This scene reuses quite some animation of Pluto sniffing from Pluto’s debut ‘The Picnic‘ (1930). Then a gamekeeper appears, but Mickey and Pluto escape him. 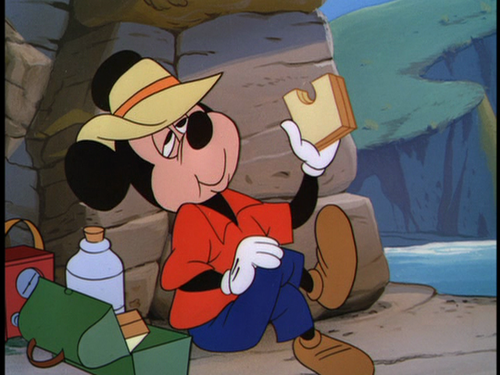 The goat-like gamekeeper would return in Floyd Gottfredson’s Mickey Mouse comic ‘Dr. Oofgay’s Secret Serum’ (July 1934). Like ‘Traffic Troubles‘, ‘The Moose Hunt‘ and ‘The Beach Party‘ from the same year, ‘Fishin’ Around’ is a genuine gag cartoon. It is the weakest of the lot, however, and can hardly be called a classic. The tricks the fish pull at Pluto and Mickey are amusing, but nothing more than that. Both the fish and Pluto steal a lot of screen time from Mickey, who is blander than ever before in this short. Nevertheless, the film is a modest example of how the Disney studio tried to improve the quality of its animation. Notice, for example, the reflections and other water effects in this short. By now, they had become standard in Disney cartoons. Moreover, the cartoon starts with some quite convincing animation of Mickey rowing. There’s some clear sense of pulling weight here, even though these cycles are interspersed with less convincing animation.